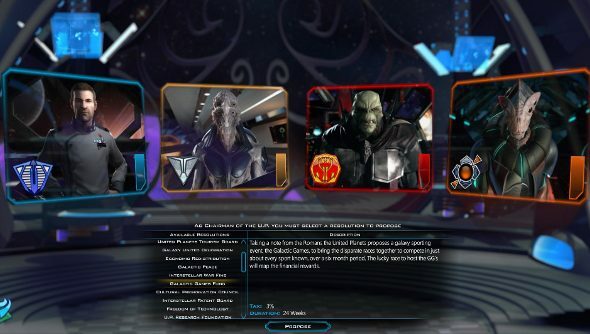 Galactic Civilizations III receives a meaty beta update today, giving space rulers options beyond blowing up other species into space dust. Now they can have lots of lovely chats, create treaties, link empires together in a web of trade routes or simply just insult their alien counterparts as a precursor to war. I had a chat with lead designer Paul Boyer to get the skinny on the update. But returning Galactic Civilizations II features don’t make up the entirety of this update. New treaties and trade opportunities have been thrown into the mix, from embargos to the trading of strategic resources, and all of these can have an impact on the attitudes of other races. Slap the gruff Drengin with an embargo, slowly choking their economy, and they are going to hold a grudge. “The mood will shift more based on the types of trades you’re doing and your agreements,” explains Boyer. A future update will see that expanded even more, with conversation trees making their way into the diplomacy screen. Leaders will be able to chit chat based on their relationship with each other, past actions, their ideologies and species. Such conversations could lead to strengthening the bonds of friendship, or they could devolve into insults. These relationships and attitudes all tie into the revamped United Planets, the big ol’ council of empires. 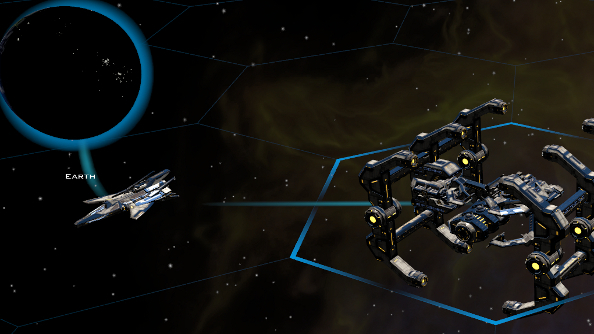 Essentially, it’s a UN on a galactic scale, but in GalCiv 2 it was fairly arbitrary. Motions would crop up, players would vote, and if the motion was carried everyone would have to go along with it. Groups voting with each other can naturally develop as their goals align, or races can be bribed in the hopes of gaining more support come the next meeting of the United Planets. It can even be used as a weapon, as players can now be elected to lead the council temporarily, choosing which motions to put forward. So if you’ve just spent all your cash on ensuring that everyone loves you and will happily vote for you to take charge for a wee while, you can then attempt to force the wealthiest race to donate money to all the other races, including your own. The United Planets can be defied, however. All bonuses would, of course, be lost, but so would any penalties. This also makes the race that leaves the UP a rogue state. It’s a big risk, because the empires that remain in the UP could pass a motion to declare war on any rogue states. 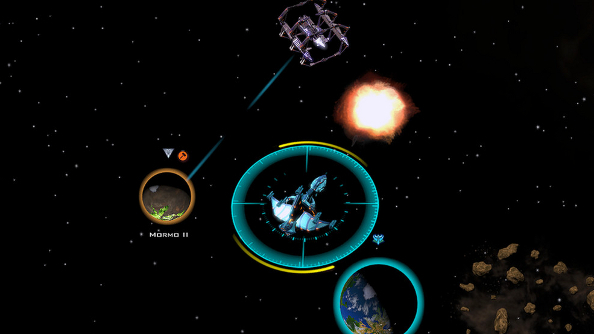 Watching the entire galaxy declare war on you would be quite stressful. A new race has also been introduced, though they are really an old race returning. 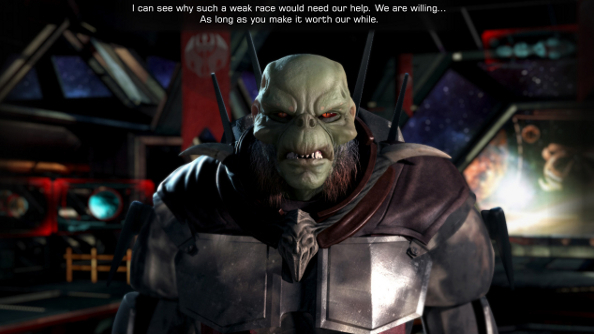 In GalCiv 2, the Krynn were a race of fundamentalist aliens who wanted to spread their influence and religion throughout the galaxy, but they’ve changed quite a bit. Before I spoke with Boyer, I was given a list of new features, which included a description of the Krynn. It painted them as a conglomeration of species in the pocket of organised crime, which sounded nothing like the original race. Fleshing out the Krynn led to making their religion, The Path, a key branch in their tech tree, uniting their influence and approval abilities into one branch. But the path diverges. Part of the Krynn’s religion teaches that sometimes things need to be done that aren’t lovely and spiritual, and that’s The Shadow Path. The religious leaders that are part of The Shadow Path are essentially the mob, controlling smuggling, unions, extortion and all the organised crime under the guise of religion. With the Krynn’s bonuses to influence, they almost seem like the perfect race to fiddle with the new diplomacy systems, and Boyer suggests that they might be a bit overpowered right now. So if you want to easily wipe the floor with the rest of the galaxy using your diplomatic skills as well as your military, you’ll probably want to take control of the Krynn now, before they become a bit more balanced. The update launches today, and you can grab the Early Access version of the game on Steam for £26.99/$44.99.